And that’s not even the Mother Earth character. Because there is always a Mother Earth character, a spiritual hippie with a warm aura and a soft lap whose words are a higher grade of fortune cookie wisdom. 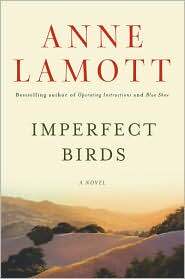 In Imperfect Birds, Lamott revisits the characters from Rosie and Crooked Little Heart. Elizabeth has been sober for a long enough spell — minus a blip a few years earlier. She’s still dabbling in higher power issues, but attending meetings. Rosie is a junior in high school, tall and lovely, no longer recreationally using cocaine (according to her diary) but definitely hopped up on a friend’s Adderall, weed, the whatever-laced-whatevers that her friends have available, and when all else fails cough syrup or glue sniffing. It’s totally cas, though. Elizabeth knows some of this. She reads Rosie’s diary and pays attention to what her daughter’s hair smells like, and monitors her uber moody moods. But whenever Elizabeth catches Rosie with pills in her jeans pocket, Rosie dulls the story to a plausible piece of fiction just bad enough to get grounded but not bad enough for big trouble. A slight of hand to distract her parents from how bad it really is. And how bad is it really? Rosie’s head is saying not bad at all, but meanwhile she bargains with herself and makes and breaks plans to shape up. The mother-daughter duo are in a tug of war for the entire book: Rosie trying to exert independence, getting good grades, and getting oozy goozy electrified by her physics teacher’s arm hair; Elizabeth going covert ops and trying to keep her daughter safe from addiction, sexual transmitted diseases, car accidents, burning buildings, and jail. This seems a bit like a cautionary tale to people with the mantra “not my kid” and it comes across as a bit like the time Helen Hunt got all crunk and belly flopped out the window of an apartment building, or something starring a Dakota Fanning wanna be on the Lifetime Network. But there is also this intersection of remembering what it feels like to sneak out of a bedroom window versus what it would be like to squirt a human being into the world, and be charged with making sure that person doesn’t sneak out bedroom windows. It is also front row seats at the freak show of what it is like to be seventeen years old in the late aughts. I definitely enjoyed this, but I’ve always enjoyed Anne Lamott and I’m a sucker for seeing what old characters from old stories are up to. (Facebook, anyone?) I like that her characters say profound sentences that sound like they were ripped from a therapy session. And I like the way families are never just the people sharing a last name, in this case there are also wayward friends unconditionally loved despite addictions and suspect decision making skills.